The ongoing change of seasons means that stronger large-scale weather systems are more likely. When something like a Colorado Cyclone moves from the Rockies and emerges into the central part of USA, it brings multiple cloud layers with it, and those many cloud layers make detection of fog and low stratus difficult. The animation above shows GOES-R IFR Probabilities and Cloud Thicknesses as well as the color-enhanced GOES-13 Brightness Temperature Difference (BTD) field. 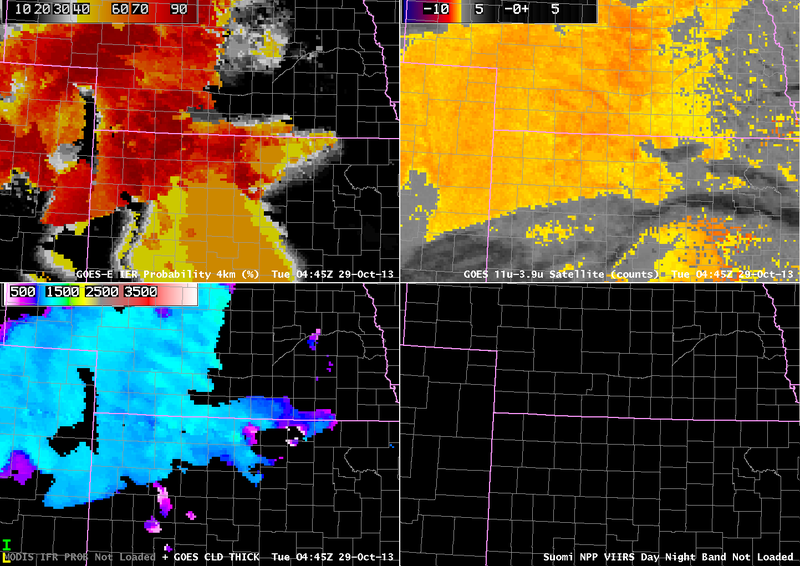 Note the characteristic signal in the BTD field of jet-level cirrus over Kansas. In these regions, BTD fields cannot be used to diagnose regions of low-level clouds because the upper-level clouds block the satellite view of lower clouds. IFR Probability does have a signal over Kansas, however (where IFR conditions are present — see the animation below). Rapid Refresh data are being used under the cirrus to diagnose the probability of IFR conditions. Thus, IFR Probability fields are filled in under regions of high cirrus. Because only model data are being used to diagnose IFR Probability fields over central and southern Kansas, the characteristic of the field is different. Where satellite and model data are used, as over western Nebraska, the IFR Probability field has a pixelated appearance; where only model data are used, as over southern Kansas, the IFR probability field has a very smooth appearance. In model-only regions, in addition, IFR Probabilities are smaller because the number of predictors available to the algorithm is smaller. The BTD field highlights regions in eastern Nebraska as having water-based clouds? Are these clouds causing low ceilings and reduced visibilities? No, and IFR probabilities in that region are low. In this region, Rapid Refresh data do not show low-level saturation, and thus the IFR Probabilities are correctly small, despite the strong satellite signal. GOES-R Cloud Thickness, shown at top, is only computed in regions where the highest cloud detected by the satellite is water-based; the algorithm considers includes information from a cloud-typing algorithm, and if clouds are ice phase (or mixed phase) as is likely in the case of jet stream cirrus, cloud thickness is not computed. (Cloud Thickness is also not computed during times of twilight — that is, an hour or so on either side of sunrise and sunset). There are still cases at night when Stray Light will contaminate/enhance the 3.9 µm signal on GOES-13, and this contamination can propagate into the GOES-R IFR Probability of Cloud Thickness Fields. In this case, only the Cloud Thickness Fields are affected (below); Cloud thickness jumps about 500 feet for one time period (0415 UTC). This entry was posted in Cloud Thickness, Plains, Stray Light on October 29, 2013 by Scott Lindstrom. Fog and low stratus developed over the Southern Plains during the morning hours of 28 October 2013. The imagery above, from near 0730 UTC, demonstrates strengths of the IFR Probability fields and inherent limitations to the traditional methods of detecting fog and low stratus: the brightness temperature difference between 10.7 µm and 3.9 µm data. For example, note the elevated stratus over the Red River Valley in southeastern OK. Both GOES and VIIRS Brightness Temperature Difference fields there show a strong signal (and the day/night band also suggest clouds are present); IFR Probabilities are low, however, and are in good agreement with the observed ceilings and visibilities that show MVFR conditions. The brightness temperature difference fields from both Suomi/NPP and from GOES show high clouds over south-central OK, in a region where IFR Conditions are observed. Rapid Refresh model data are being used in this region to diagnose — accurately — the presence of visibility-restricting fog and low stratus. As is typical when Rapid Refresh data are the primary means of diagnosing IFR Probabilities (because high clouds prevent the satellite from seeing water-based clouds near the surface), the IFR probability field is smooth. This entry was posted in Day/Night Band, MODIS, Plains, Suomi/NPP, Uncategorized on October 28, 2013 by Scott Lindstrom. The animation above shows GOES-R IFR Probabilities highest in a band that stretches mostly north-south from western North Dakota into central South Dakota. IFR conditions are observed under and near this band, for example at Stanley, North Dakota. The occasional MODIS-based IFR Probabilities also suggest that IFR conditions are most likely over the western Dakotas. Both GOES-based and MODIS-based IFR Probability fields de-emphasize the regions of enhanced brightness temperature difference (in both GOES and Suomi-NPP Fields) that exist over western Minnesota and the central and eastern Dakotas. In these regions, mid-level stratus is being detected by the satellite. The Rapid Refresh model is correctly diagnosing the clouds as elevated, and that model information is used to de-emphasize (correctly) the possibility of IFR conditions. IFR and near-IFR conditions also occur over parts of northeast Minnesota into northwest Wisconsin where IFR probabilities are higher. A limitation of the traditional brightness temperature difference product is highlighted above in the toggle between the GOES-R IFR Probability and the Brightness Temperature Difference at 0945 UTC. Mid-level stratus and low stratus/fog look nearly identical in the brightness temperature difference product, but the latter is very significant for aviation. Thus the need to better highlight regions of IFR conditions by using the fused data product that incorporates surface information by way of the Rapid Refresh model. Lunar illumination is particularly strong at this time (Full moon occurred late last week), so the day/night band on Suomi/NPP gives compelling visible imagery. As with the case with brightness temperature difference products, however, it can be difficult to distinguish between mid-level stratus and low stratus in the Day/Night band. Toggles between the Day/Night band and the Brightness Temperature Difference from Suomi/NPP is at both 0736 and 0918 UTC are below. Work proceeds on incorporating Suomi/NPP data into the GOES-R IFR Probability algorithm. This entry was posted in MODIS, Northern Plains, Suomi/NPP on October 22, 2013 by Scott Lindstrom. IFR Conditions developed around the Puget Sound during the night of 20 October. How did the GOES-R IFR Probabilities capture this event? The animation above includes imagery from 0500, 0900, 0945, 1115 and 1915 UTC. Higher-resolution polar orbiter data (from MODIS and Suomi/NPP) shows the value of higher-resolution in capturing fog that settles into valleys over southeast British Columbia and western Washington. GOES data are unable to resolve those features. The Brightness Temperature difference fields have a strong signal over the Pacific Ocean and adjacent coastal areas (IFR Probabilities are high in those regions: both satellite data and Rapid Refresh data are consistent with a high likelihood of fog/low stratus). Over land, the signal is more noisy, perhaps because of differences in land emissivity. (That noise is not present when the sun is up — at that time the brightness temperature difference signal is determined by reflected solar radiation). Where the brightness temperature difference signal is smaller over land, the IFR Probability is also lower. That it is not even smaller suggests that model fields are at or near saturation over land. Note also a strength of the IFR Probability: A consistent signal both day and night. IFR Probabilities are high over Seattle where IFR conditions persist. The Suomi-NPP Day/Night band can give a good indication of where clouds are present at night when, as occurred last night, the moon is near full. (The Day/Night band does not, however, by itself give any indication of surface visibility) In the example above, the clouds do not change much in the 90 minutes between overpasses. (The slight shift in the apparent location of snow-covered mountains is apparently due to parallax) GOES can just barely resolve the very thin fog features that are so evident in the Suomi/NPP data. This entry was posted in Day/Night Band, MODIS, Pacific Northwest, Suomi/NPP on October 21, 2013 by Scott Lindstrom. Strong extratropical storms that move northward into the Gulf of Alaska, or into the Bering Sea, can bring IFR conditions to many parts of Alaska. However, they typically also bring multiple cloud layers that make traditional satellite-only methods of detecting fog and low stratus problematic. In cases like these, a fused product that incorporates model predictions of low-level saturation is helpful in defining just where IFR conditions are most likely. For example, the brightness temperature difference field, above, does not show a strong signal in regions where near-IFR conditions are present. In contrast, the IFR Probability field, below, that incorporates model fields that are influenced by surface features, better highlights the region of IFR conditions. It captures the edge of the fog/low stratus field over SW Alaska, and probabilities are highest in regions where IFR and near-IFR conditions exist. The relatively flat field over land is a typical feature of the IFR Probability when it is determined chiefly by model data. Because satellite data are not included in the predictors, the total probability is somewhat smaller. Where the satellite brightness temperature difference field does have a strong signal is where the IFR Probabilities are highest (over the Bering Sea). One shortcoming with IFR Probability is the pixel resolution at high latitudes. MODIS data can also be used to compute IFR Probabilities, and three comparisons between MODIS and GOES values are shown below. Alaska’s high latitudes means not only large GOES pixels, but also fairly frequent coverage from the polar-orbiting Terra and Aqua satellites that hold the MODIS instrument. This entry was posted in Alaska, MODIS, Multiple Cloud Layers on October 16, 2013 by Scott Lindstrom. The toggle between the GOES-based and MODIS-based IFR Probabilities, above, shows how high-resolution MODIS data can give an earlier alert to the formation than is possible from GOES. Fog formed in the Cumberland Valley of central Tennessee and southeast Kentucky early in the morning of 11 October. MODIS-based IFR Probabilities over the river valley are peaking around 45% at 0415 UTC (vs. 5% for GOES-based IFR Probabilities). In fact, GOES-based IFR Probabilities do not reach 45% until about 0515 UTC, a full hour later. The toggle below shows the two brightness temperature difference products used at ~0415 UTC to make the IFR Probability fields. MODIS data are better able to resolve the small-scale river valleys where fog is forming earlier. The animation below shows the fog quickly burning off in the morning. It has dissipated by 1500 UTC. This entry was posted in MODIS, Southeast on October 11, 2013 by Scott Lindstrom. The GOES-R IFR Probability product gave useful advance warning to the development of fog near Lake Michigan’s eastern shore overnight. 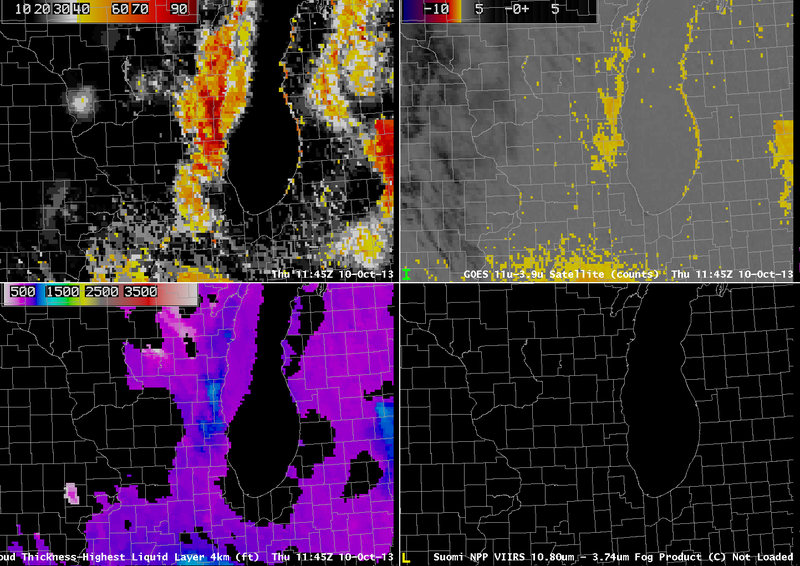 The image above, from 0615 UTC, shows a flat brightness temperature difference field over the lakeshore counties in Wisconsin and Illinois (values are from -7.1 to -7.3); there are two regions of high values in the IFR Probability field, however: Near Manitowoc WI (values up to 29%) and over southeast WI and northeast IL (values near 20%). So by 0615 UTC on 10 October, IFR Probabilities are suggestive of a nascent fog development. Forty-five minutes later, at 0702 UTC (above), IFR Probabilities have increased dramatically in eastern WI even as the brightness temperature difference field remains flat. Thus, the Rapid Refresh Data is accurately capturing the development of low-level saturation in the atmosphere, and that is influencing the IFR probability field. 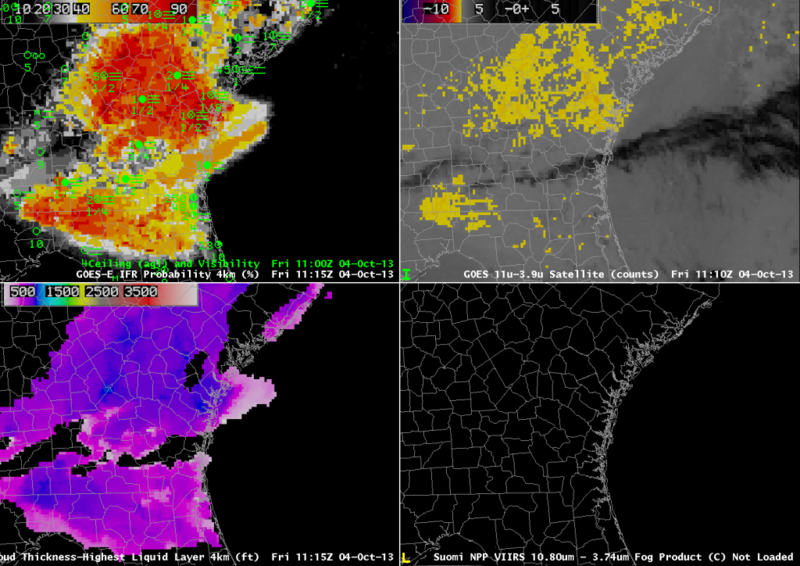 In addition, the GOES-R Cloud Thickness field is suggesting that the cloud bank is 500-600 feet thick. The strip of enhanced brightness temperature difference paralleling the Lake Michigan shore in lower Michigan is an artifact of the co-registration error between the 10.7 µm and 3.9 µm band detectors on GOES-13. Between 0656 UTC and 0734 UTC, visibility at Manitowoc, WI (KMTW), dropped from 5 to 3/4 statute miles. The visibility at Burlington WI (KBUU) dropped from 4 to 1 statute miles between 0600 and 0700 UTC, and Waukegan, IL (KUGN) reported a visibility of 1/4 mile at 0552 UTC and 0652 UTC. At 0802 UTC, the GOES-East brightness temperature difference field shows greater differences over the region of SE Wisconsin where the fog is developing. Accordingly, the IFR probability increases past 80% IFR Probabilities are near 70% in Manitowoc County (and Manitowoc reported 1/2-mile visibility at 0834 UTC). Compare the GOES-East and Suomi/NPP Brightness Temperature Difference Fields; note the lack of a signal in the Suomi/NPP field along the western shore of Lake Michigan, confirming the co-registration error present in GOES-13. The last pre-sunrise image, 1145 UTC, shows a definite signal of fog/low stratus in both the IFR Probability field and in the Brightness Temperature Difference field. However, the early detection in the IFR Probability field gives a nice head’s up to the forecaster. Note also in this image how the strong signal in the brightness temperature difference field that arises because of the co-registration error can contaminate the IFR Probability field. The Cloud Thickness in this field has been related to dissipation time, as shown in this chart. The maximum thickness of 1000 feet predicts a dissipation time around 1500 UTC. The 1445 and 1515 UTC GOES-13 visible images are shown below. This entry was posted in Cloud Thickness, Error Explanations, Midwest, Suomi/NPP, Wisconsin on October 10, 2013 by Scott Lindstrom. High Pressure of the southeast US allowed for clear skies and light winds overnight, and radiation fog developed over coastal portions of eastern Georgia. Because high clouds were present, the traditional method for detecting fog and low stratus, the brightness temperature difference between 10.7 µm and 3.9 µm on GOES could not capture the entire areal extent of the cloud. Fog is initially reported in eastern Georgia where IFR Probabilities are increasing underneath an ice-phase cloud deck that prevents the GOES satellite from seeing the development of low clouds and fog. Accordingly, the IFR probabilities are lower than they would be if satellite data were included. The uniform nature of the field is testament to the use of Rapid Refresh Data to drive the IFR Probability field. Shortly after 0600 UTC, a satellite signal develops over South Carolina as the high clouds shift to the south. When this happens, IFR probabilities increase (and acquire a more pixelated look). Regions under high clouds with IFR conditions persist through the end of the loop, however. It’s important to have a fused data product that allows two different complementary fields to diagnose where IFR conditions are likely. Where the brightness temperature difference cannot be used, Rapid Refresh Data gives vital information. Where brightness temperature difference data can be used, the Rapid Refresh Data can fine-tune things. The 1115 UTC image, above, shows the GOES-R cloud thickness just before twilight conditions that accompany sunrise prohibit its computation. The cloud thickness in a radiation fog is related to dissipation time, and the cloud thickness is shown to be quite thin: Thickest values, in blue, are around 800 to 900 feet. This scatterplot relates cloud thickness to dissipation time, and it suggests a dissipation time of 1-2 hours. However, the visible imagery animation, below, shows actual dissipation occurred shortly after 1500 UTC. Note that there is considerable spread in that predictive scatterplot. This entry was posted in Cloud Thickness, Southeast, Suomi/NPP, Uncategorized on October 4, 2013 by Scott Lindstrom.